1 zack snyder | This Blog Rules | Why go elsewhere? Let’s face it: if a zombie plague were to arise, and one probably will in the near future, we’d all be screwed. Think about it: an outbreak of reanimated corpses would spread throughout the nation like wildfire, with the infected slaughtering millions and turning the bitten into their own: the walking dead, fond of the taste of flesh and always, relentlessly hungry. Never mind how many baseball bats or sawn-off boomsticks are in your possession, nor if the zombies are the moaning shufflers of George A. Romero’s “Dead” trilogy or the snarling Olympians of Danny Boyle’s “28 Days Later” and Zack Snyder’s “Dawn of the Dead” remake: they’ll find you, they’ll get you and, if you’re lucky, they’ll eat you dead. That is, if you’re not the proud owner of this zombie-proof abode, ingeniously designed by Polish architect Robert Konieczny of KWK Promes. 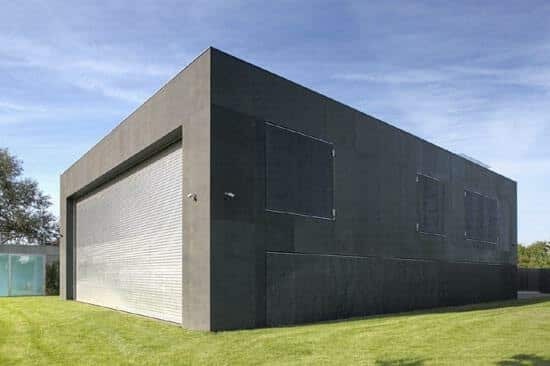 Built specifically to withstand an unwanted horde of braindead brain-nibblers, “The Safe House” stands in a small village located on the outskirts of Warsaw, Poland. It is an awesome piece of architecture and, more importantly, looks super-effective. It has a draw bridge, concrete window shutters, movable walls, only one entrance (on the second floor, accessible through the bridge), and a retractable metal gate. Upon closing up, the house looks like nothing more than a concrete box – unsightly perhaps, but completely protective.